This survey of sculptural artefacts from the last five decades is nothing if not spectacular – in the sense of its containing spectacles. On entering, the first thing one alights on is an Anish Kapoor set of four distorting mirrors which could have been plucked out of a fun fair. Mr Mirror Man invites us to look at ourselves anew, and have endless fun laughing at ourselves as we appear to bend, shrink, inflate and contort. Whatever you make of it, every art gallery should have one, to stop ourselves taking ourselves (and Mr Kapoor) too seriously. Perhaps smaller versions of the distorting mirror could be carefully placed alongside picture captions to make them even more incomprehensible (© C. Challen). Not that I’m saying the Hayward’s captions are unintelligible, but there is let’s face it an art to it. After all, many visitors will spend more time reading captions then looking at the art. But I digress. We can see ourselves again in Yayoi Kusama’s balls. Narcissus Garden has appeared at venues around the globe, and could be a bigger then life-size collection of ball bearings, each shining like a jewel. Like everything else here, you are prohibited from touching the orbs. It is very tempting to set them all rolling about. They’re made of stainless steel, so I don’t know how dangerous that would be, it could be like being inside a pinball machine. In fact, I think a gallery which had its visitors navigating through a giant sized pinball machine would be quite fun (© C.Challen). But I digress. The highlight of the show is Richard Wilson’s 20:50. I think I first saw this a few years ago on my first and only visit to the Saatchi Gallery in Sloaneland. 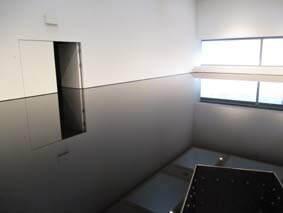 Before entering the space one is warned not to lean over the edge – the work is made of old engine oil, poured into a sealed room. The surface is flatter than a pancake and is mirror-like shiny. But blow on it, and faint ripples can be seen. It is unearthly, even somewhat sinister, as it appears it could be of infinite depth but then it could equally be very shallow. It is best not to stick your finger in it. It reminds me of a scene from the Scarlett Johansson vampire film Under The Skin, where she lures a naked victim into liquid extermination. I suspect the liquid is no more than six inches deep. The gallery assistant didn’t really want to share any information on this aspect of the sculpture (? ), the whole thing must remain a mystery. One is aware of 20:50 before entering the space, due to its smell. But it’s definitely not something you’d want to scratch the surface of. Recommended. What does the phrase ‘South Korean Art’ bring to mind? If anything, possibly something portraying an idealised landscape, or something brightly painted in, for want of a better expression, fairground colours. In other words, the answer is probably no idea. Lee Bul’s exhibition at the Hayward Gallery would certainly explode any misconceptions. In fact, as reported recently some of the exhibits – rotting fish – had to be removed from display because they were literally exploding. There’s invention for you. This show features works from Lee Bul’s 30 year career, and takes us back to a time when South Korea was ruled by military dictatorships through to the present day of economic success. ​But I digress. The range of work exhibited here attests to a truly inventive and for that matter politically attuned mind, and I can only say is worthy of attention for its boldness in experimentation and originality. And all this was going on in a conservative culture, unlike the pretentious upstarts nicking ideas celebrated in our own nihilistic YBA fantasy world.